In 1830 Ashurst with its small enclosures and wide hedgerows was said to have the appearance of “an entire wood”. The 2,251 acres (911 ha) of the parish had been like that for many centuries and really remains like that today. Prior to the Norman Conquest the parish basically as we know it today was divided and in the control of three manors. This gradually changed as the inhabitants of the area were given control of the affairs of the parish mainly through the church and their elected representatives. The West Sussex County Council was created in 1888 to look after the roads and county as a whole. The Parish Council was created in 1894 as was the district council known as Steyning West Rural District Council. The population in 1724 was 50 families and had grown in 1801 to 55 houses giving accommodation to 73 families and 385 people (the first government census). By 1891 this had reached 73 houses and 329 people. In 2006 it was just over 100 houses with 220 people. However in 1893 we find the then vicar of Ashurst, The Rev.A.Jackson, was organising a library, temperance society, a weekly mothers meeting, a Sunday bible class and a series of fortnightly entertainments. There were also choral concerts in the church at this time. He had also stated a little earlier that there were no “really poor” in the parish. There was a private dame school started in Ashurst in 1809 which carried on until about 1873 when the present school was started by the church with the help of local people. This was in the dwelling that was previously a “poor house” for those unable to support themselves and their families. In 1874 there were 64 children attending the school. During the early part of the last century an organ was donated to the church by Mrs Thornton of Lock and the Village Hall was built on land given by the owner of Eatons, Mr Campion. The building was built with the support of three local landowners. In 1932 the recreation ground was purchased with the help of Mr Lloyd a local landowner. There is mention of a church in Ashurst before 1200 but the registers for births, marriages and deaths start in 1560. The church bells have dates starting in 1719. The list of Rectors of Ashurst start in 1401 and remained separate from Steyning until 1952 when it was made in plurality with Steyning vicarage. 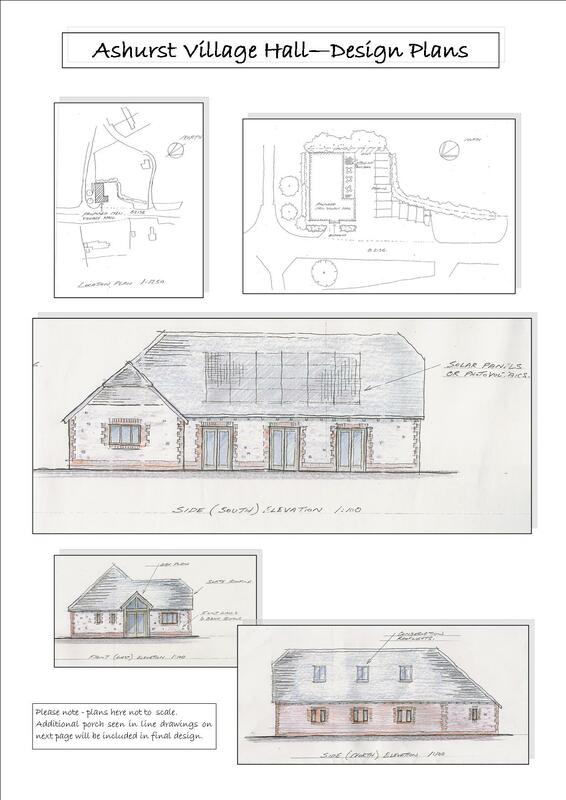 Following public consultations spanning the last four years and with consideration for the current poor state of the present hall – an application was made for Planning Permission for a new hall in the Autumn of 2010. Planning Permission was indeed granted, with the full support of both the local Parish Council and Horsham District Council. Foundations were laid in December 2012 and the contractors Vasahus have done an amazing job constructing the new hall Parts of the timber frame came all the way from Denmark by boat. Funding applications have been very successful with major funding from Viridor Credits, RPDE Leaders, Cordek Ltd, The Big Society Fund, the Garfield Weston Foundation, Waitrose and a host of individual donations and pledges. Local fundraising initiatives have also ensured the success of the project, including the brilliant Ashurst Fair & Fun Dog Show. Now the new hall is complete and hired out for a range of activities and events.Our fundraising now aims to add solar panels to the roof. If you would like to help in any way, please do contact any committee member. Gift Aid forms are available from the secretary should you wish to make a donation. View the design plans here…(please note plans here shown not to scale).